Edward Lear (1812–1888), Mount Olympus from Larissa, Thessaly, Greece (1848–88), watercolour, 17.8 x 38.1 cm, Metropolitan Museum of Art, New York, NY. Wikimedia Commons. On the face of it, Edward Lear (1812–1888) shouldn’t have survived beyond childhood, let alone become the enormously creative genius which he did. Best known for his nonsense rhymes, limericks, and humorous verse – like The Owl and the Pussycat and The Jumblies – he was also a prolific draughtsman and painter. In this article and the next, I’ll show a selection of his drawings and paintings which should change your appreciation of him as an artist. Edward Lear was born in Highgate, London, the twentieth child out of twenty-one, and the youngest to survive to adult life. His parents were middle class, not affluent enough to be able to raise all those children, so when he was four, Lear was handed to his eldest sister Ann, then aged twenty-five, for her to raise him independently. Lear’s health was a worry through his entire life. When he was six, he started to suffer from grand mal fits, which continued through adulthood. Fortunately he learned how to sense when a fit was imminent, and was able to remove himself from the public before the fit started. He also suffered from chest problems, including asthma and bronchitis, from early childhood. He started to suffer from bouts of depression (which might have been part of bipolar disorder, perhaps) when he was only seven, which he later referred to as ‘the morbids’. By 1828, at the age of sixteen, Lear was drawing to supplement his sister’s income, and quickly became the leading natural history artist in Britain. His first published illustrations appeared in a two-volume treatise on parrots when he was only nineteen, in 1830. In 1831, he met the ornithologist John Gould, and toured Europe with him, drawing and painting birds for publication. 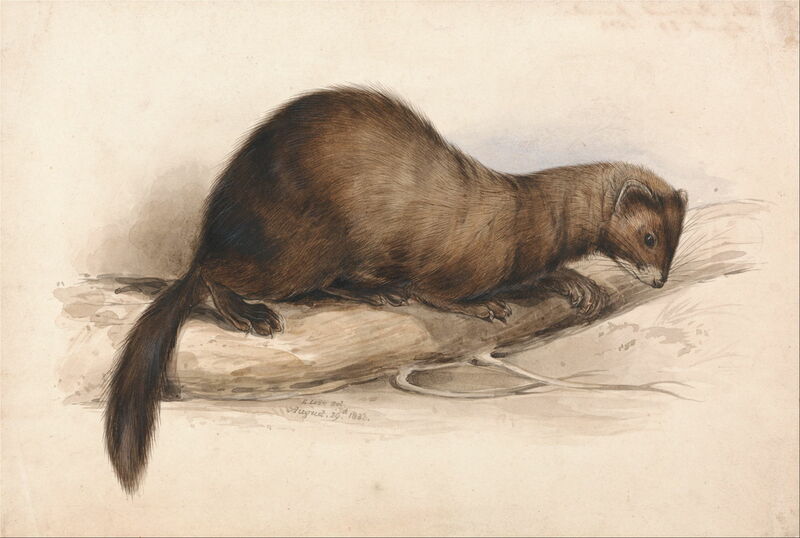 Edward Lear (1812–1888), A Weasel (1832), watercolor with pen in brown ink, with gouache and gum over graphite on medium, smooth, cream wove paper, 18.7 x 27.9 cm, Yale Center for British Art, New Haven, CT. Wikimedia Commons. Lear’s coverage of natural history extended well beyond birds, to faithful watercolours of mammals such as this Weasel (1832). Edward Lear (1812–1888) Ramphastos toco (a toucan) (1833), illustration in ‘A monograph of the Ramphastidae: or family of toucans’, John Gould, 1834, Houghton Library, Harvard University, Cambridge, MA. Wikimedia Commons. 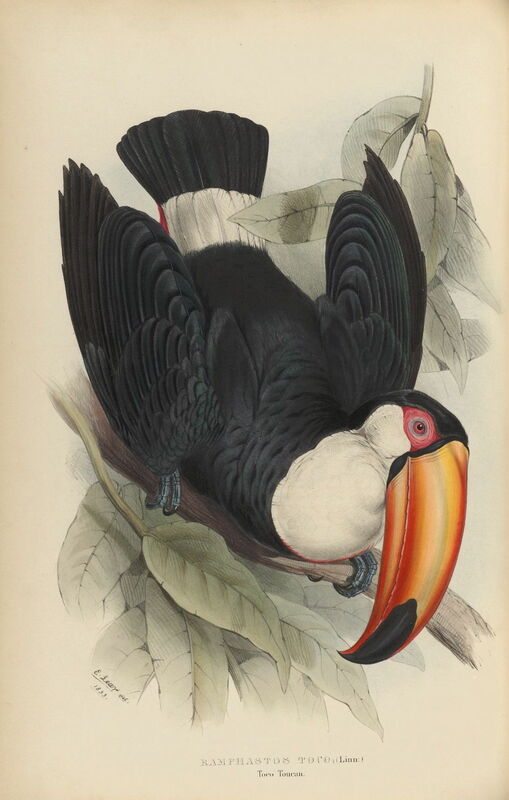 In 1833, Lear painted a set of superb illustrations for John Gould’s A monograph of the Ramphastidae: or family of toucans, which was published the following year. Among them is Ramphastos toco. Unlike John James Audubon, much of whose work was painted a few years earlier, Lear pioneered working from live rather than dead specimens or skins. In 1835, Lear started touring overseas with patrons such as the Bishop of Norwich and Lord Stanley, later to become the Earl of Derby. Their first tour took them walking in Ireland, but the following year Lear visited the Lake District, in the north-west of England. Edward Lear (1812–1888), Derwentwater, September 1836 (1836), graphite with stumping and white gouache on moderately thick, slightly textured, gray-green wove paper”, 17 x 25.4 cm, Yale Center for British Art, New Haven, CT. Wikimedia Commons. 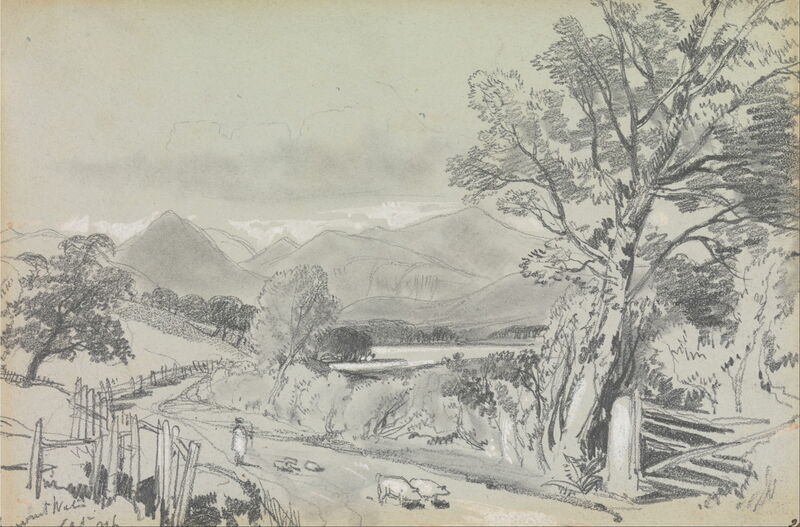 Derwentwater, September 1836, sketched during that visit, gives an idea of his graphite and wash sketches made in front of the motif. He also augmented these with watercolour, and frequently wrote detailed information about colours, etc., on them. Lear’s eyesight had been starting to trouble him, and he realised that he would not be able to work in the fine detail required for natural history illustration much longer. During this tour, he decided that he would focus his efforts on landscape painting. 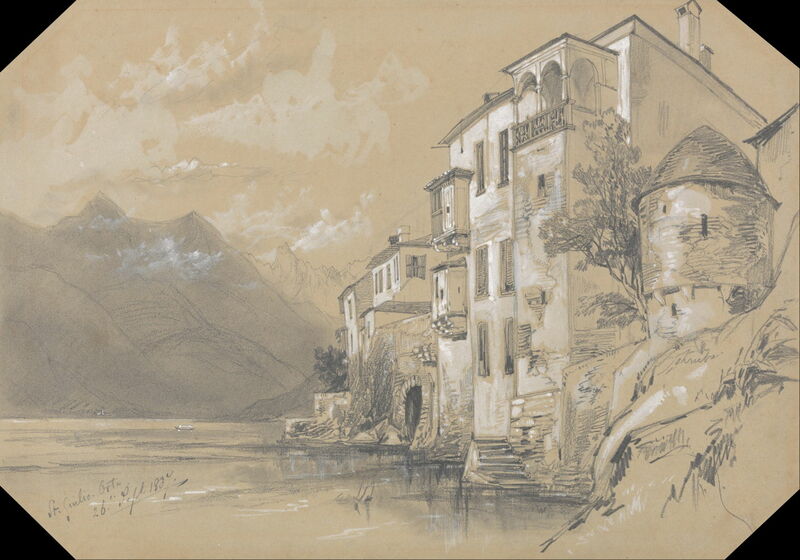 Edward Lear (1812–1888), St. Giulio, Orta, 26 September 1837 (1837), graphite with stumping and white gouache on moderately thick, moderately textured, gray-green wove paper, 25.4 x 36.2 cm, Yale Center for British Art, New Haven, CT. Wikimedia Commons. The following year, Lear went for a second time to the continent of Europe, and travelled through Belgium, Germany, Switzerland, and northern Italy before reaching Rome. This graphite and watercolour sketch of St. Giulio, Orta, 26 September 1837 is a good example of these quite highly finished sketches which he made on tour. 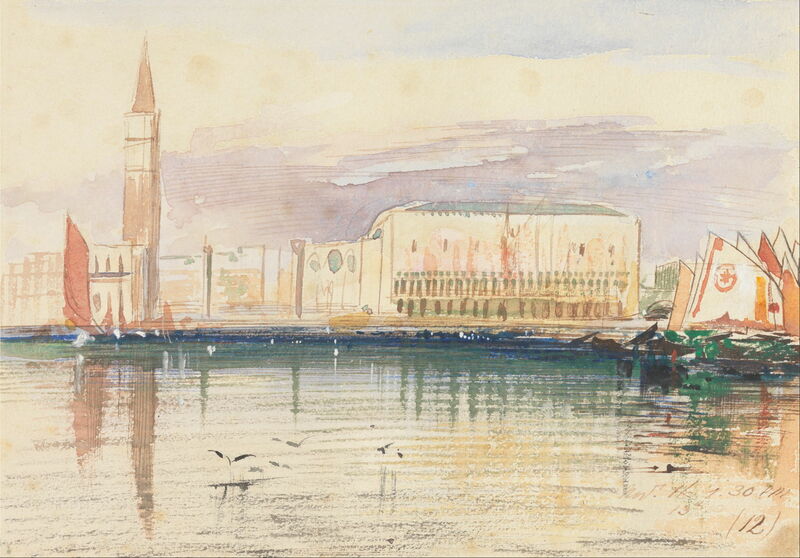 Edward Lear (1812–1888), Venice, the Doge’s Palace (date not known), watercolor with pen in brown ink over graphite and, gouache on wove paper on medium, moderately textured, cream wove paper, 17.8 x 25.2 cm, Yale Center for British Art, New Haven, CT. Wikimedia Commons. Between 1838-1848, Lear lived in Rome, making occasional visits to Britain when he needed to. This quick plein air watercolour sketch of Venice, the Doge’s Palace is undated, but may well have been painted during this period. During the 1840s, Lear was busy publishing his first books for general readership. These reached a peak in 1846, when he published two illustrated volumes of his travels in Italy, the first edition of his famous A Book of Nonsense, and provided illustrations for a book written by JE Gray. He also gave a series of drawing lessons to Queen Victoria, when she was staying at her retreat, Osborne House, on the Isle of Wight. Political disturbances in Italy during 1847 drove Lear to travel further afield the following year, when he first visited the island of Malta, and went on to Greece, Turkey, and Albania. He returned to live in England from 1849-53, travelling back to Europe from there. Recognising his limited art education, and lack of experience painting in oils, in 1850 he was accepted as a student at the Royal Academy Schools in London. He did not stay long there, and in 1852 made friends with William Holman Hunt, who taught him more advanced techniques of oil painting, and remained a close friend. 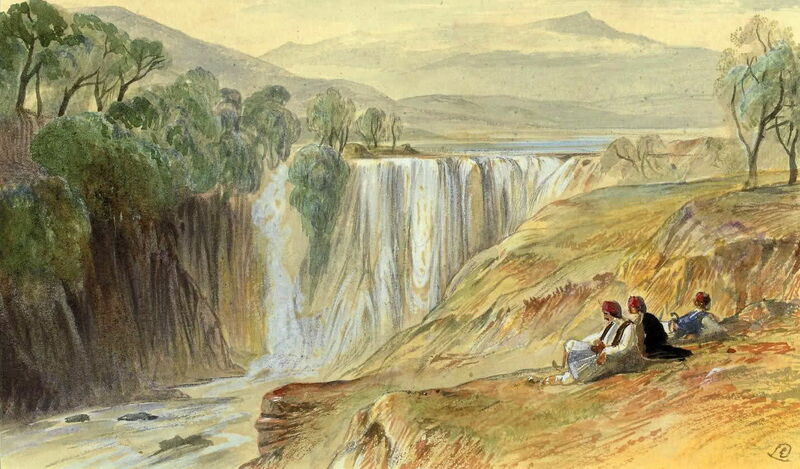 Edward Lear (1812–1888), The Falls of the Kalama, Albania (1851), further details not known. Wikimedia Commons. The Falls of the Kalama, Albania (1851) is one of many paintings which he made of the dramatic scenery in Albania, which was almost unknown through much of the rest of Europe at that time. Lear’s finished watercolours of this period often attain an epic magnificence: Mount Olympus from Larissa, Thessaly, Greece was painted after 1848 during one of his many visits to Greece. Edward Lear (1812–1888), A Distant View of Mt Athos (1856), pen & sepia ink, watercolour on paper, 14.8 x 22.3 cm, Art Gallery of South Australia, Adelaide, Australia. Wikimedia Commons. 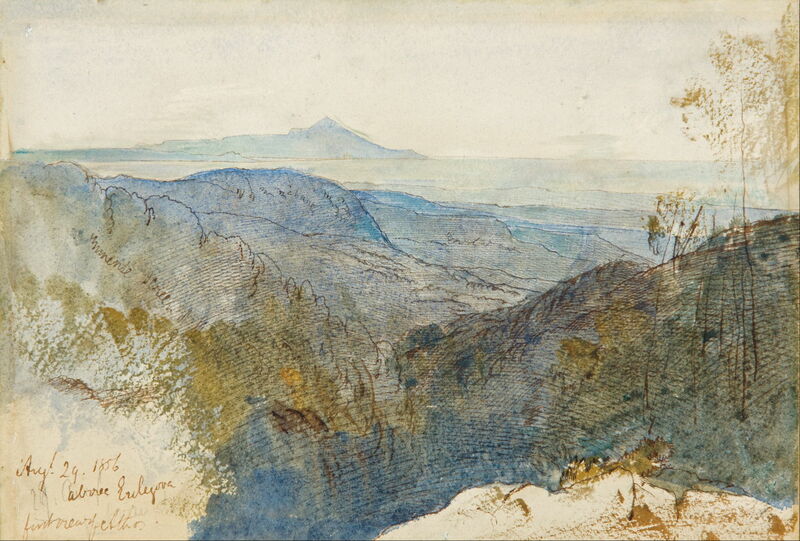 His sketching methods had also become more refined, as shown in this pen, ink, and watercolour Distant View of Mt Athos (1856). Edward Lear (1812–1888), Mount Athos and the Monastery of Stavronikétes (1857), oil on canvas, 34.3 x 54.6 cm, Yale Center for British Art, New Haven, CT. Wikimedia Commons. 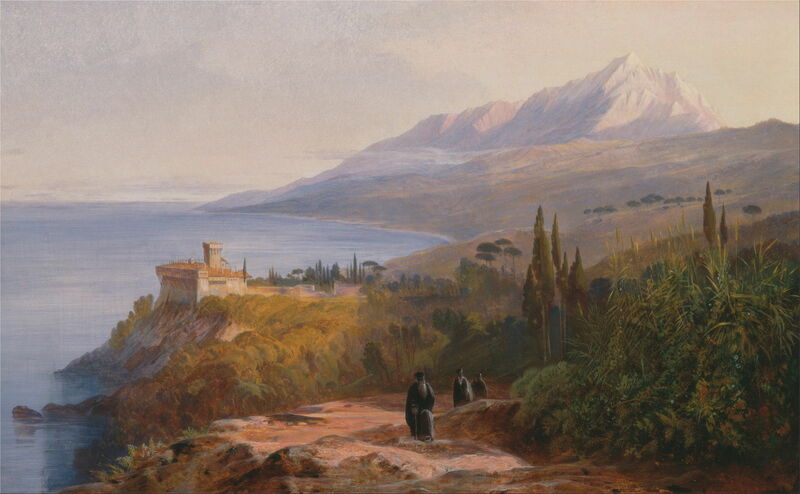 His time spent with William Holman Hunt was repaid in his oil paintings, here of Mount Athos and the Monastery of Stavronikétes (1857). Although Lear does seem to have painted some oil sketches en plein air, he generally preferred to make pen and watercolour studies in front of the motif, and turn those into finished oil paintings back in his studio. From 1855-58, he lived in Corfu, from where he continued to travel extensively, including visiting the site of Troy, and returning to Albania. He then lived in London until 1860. Posted in General, Life, Painting and tagged Audubon, Hunt, landscape, Lear, natural history, painting, travel. Bookmark the permalink. I found this very interesting. Such beautiful illustrations. Thank you for a very illuminating post. I have long thought Lear’s paintings even better than his poetry, and cannot understand why his art is so neglected. There’s a second part coming tomorrow, with some of his best paintings too.